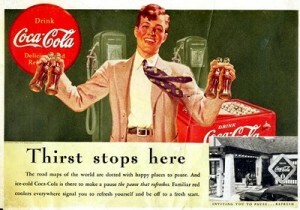 And it has been used for a long time in the history of commercials, like this commercial from Coca Cola from 1939. In pictures that are made for commercials for fashion and fashion items is a smile rare. The faces in these pictures often look serious, mad or elevated. In this picture, the girl looks serious. The idea behind is that a beautiful picture sells a product. Another point is that the faces in fashion commercials have to spread a certain status. When e person smiles, it often gives a feeling of equality, but here they try to give an exhalted feeling, making the model in the picture look serious, and sending a nonverbal sign or feeling that she feels better than the ‘normal’ person, who doesnt use this product.